The World Building was built in 1964 for $1.5 million. It is 10 stories tall and has 70,000 square feet of space. 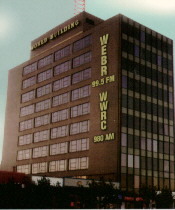 The building is best known for housing the radio stations WGAY and WRC. Georgia Avenue had to be closed to allow a crane to hoist the WGAY transmitter to the penthouse for installation. When the transmitter was uncrated, it was found to be the wrong model. It had to be hoisted back down to the street and returned to the manufacturer. The correct transmitter was later installed. In 1991, a fire caused $1 million in damage to the building. Photo from the Silver Spring Chamber of Commerce. Note that the building never actually looked like this; those call letters were never on the building. Photo by Dan Gross, Silver Spring Gazette. 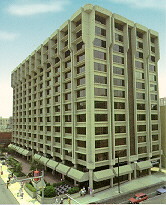 The National Oceanic and Atmospheric Administration moved into several buildings by the Silver Spring Metro station in 1993. However, one of the buildings became known as a "sick building" and had to be repaired at great expense. The problems were featured on ABC's "World News Tonight" and other programs. There is also a NOAA Science Center featuring educational exhibits. The 1.3 million square foot complex houses 4,700 NOAA workers and is valued at more than $130 million. The Montgomery Center is on the site that served as animal pens for the Kengla Brothers slaughterhouse from 1916 to 1923. A movie theatre used to operate under the building; it was reached by escalator. Photo from the Silver Spring Chamber of Commerce. Above Photo by Tim Sloan, Silver Spring Gazette. Above upper-right photo from the Silver Spring Chamber of Commerce. Station Square - The Atrium is one of several office buildings developed by Lloyd Moore & Associates. The $85 million project has a half-million suqare feet of office space. Silver Spring Centre is on the site of the former a Sears store. It has 215,000 square feet and was built in 1987. The building also houses a post office. 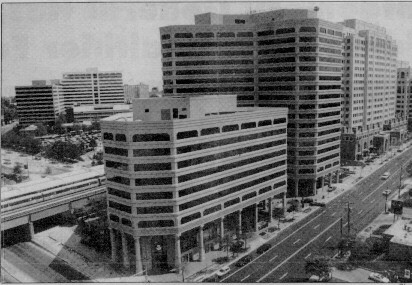 Silver Spring Metro Plaza, adjacent to the Metro station, is on the site of the former TW Perry lumberyard. Made up of three buildings, it features a central pedestrian plaza with fountains. This building is in the art deco stlye.